Going back to my analysis of a GS turn, I left out some of the finer or more advanced points of ski technique and just focused on what I consider basics. Mastering these finer points of technique make the difference between the best and the rest. Back to skis flat, in frame 4, you can see her maintaining the hips countered. Also, she is not overly hunched forward at the hip. This keeps the hips "open" and allows her to move forward and down the slope, among other things. If she rotated, the hips would be closed (i.e. pointed where the skis are pointed). Many tend to rotate with the skis at this point and the first effect is shooting up straight and long instead of down the slope. Also, movement down the hill becomes limited, leading to building angles via inclination into the turn instead of rolling the ankles - it just gets worse and worse. 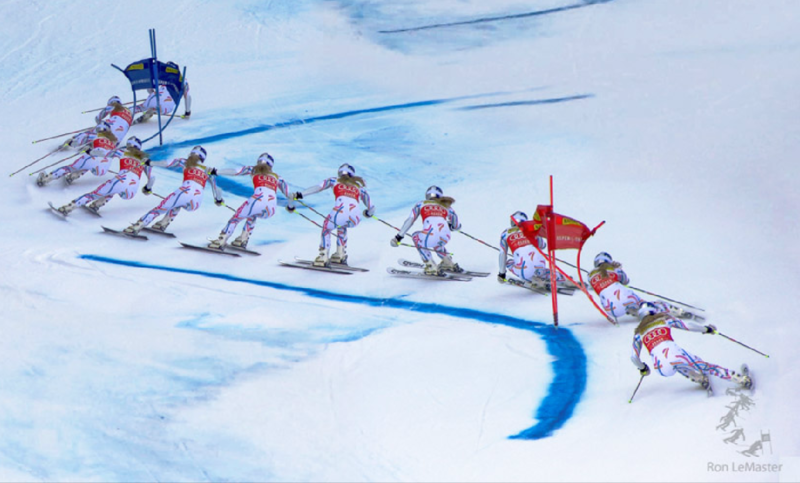 As the turn ends, the best racers are coiling: basically, as the skis turn across the scope, the hips and upper body are turning the other way (resulting in a relatively stable position to the snow). This first of all, enhances the finish of the previous turn and also "builds up" energy in the body, much like spring or rubber band you twist. Again, the hips are well countered in frames 4-5, she does not rotate with the skis. Another advantage is that it keeps the hips "open", allowing movement down the slope. As the next turn begins, the "stored" energy is used to "uncoil" and it helps dig the skis into the snow sooner and establishes a new platform and even starts the new turn sooner. Since we're talking about counter, a weaker skier or an out-of balance skier or one that was late at the gate may have been countering more even at the fall line, turning the hips to the outside, to get more grip and align the weaker body better on the outside ski, when max pressure built up. Many prefer to incline into turns, but not the best. You can see the play between separation (coiling or counteracting) and counterbalancing (angulation) throughout the turn. This is how she balances on the outside ski when it matters, i.e. at maximum pressure. The timing of angulation is very important as well - you can see she uses it to end the turn as well, this is another important element. The hips are the last to move into the new turn. After skis flat in frame 4, the ankles tip the knees into the turn and the hips are effectively held back through 5-6-7-8 while the large angles develop. Only then does she let the hips move into the turn, to get even more mass inside and bigger angles. Floating is a term describing how the skis/skier "floats" through the transition to the next turn, if you manage to get enough energy from the previous turn - you can see that her skis are mostly floating through transition. In an effective transition, the floating is limited to the skis - the body is decoupled from this and not disturbed, via flexing, which absorbed the energy. If you're not effectively separating the upper body, it will get pushed up and out of balance... do not confuse "floating" for getting shot up and out of the turn! The skis don't have to be in the air to be a good "float", like in frame 4. Just skimming the surface is good too. The point is that there is no weight on them and this makes them very easy to adjust, tip on edge or whatever. It is not the case here, but stepping is an old technique where, in frame 4, you would actually step the uphill ski (new outside or old inside) up the hill, to get a higher line at the gate. Nowadays it is considered generally a mistake, except when you need it, sic! Viewed 1202 times ( | Print ) this page.